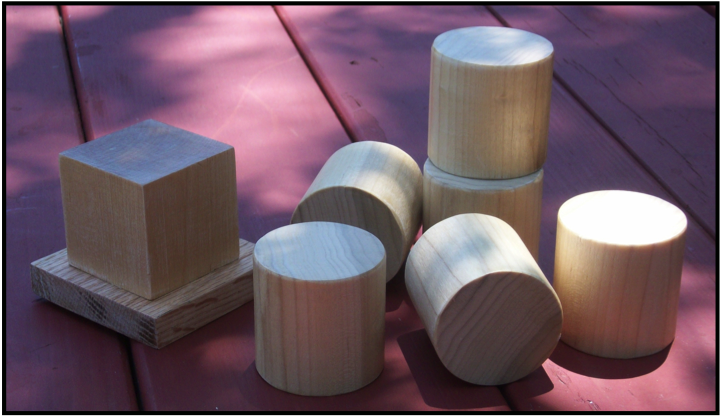 As promised in the previous post on Alphabet Blocks, this post will focus on a tower-building activity. This activity was just one of the many enjoyable times grandmother and I had when our three grand kids from Georgia came to visit. Next summer, there’s a chance I might teach a course about construction forces, forces like compression, tension, etc., to K–8 teachers. For the course I wanted to build a model of Trajan’s column in Rome but I needed a set of cylindrical blocks. These are not traditional building blocks and I was unable to find a set of cylindrical blocks for sale. I made a quick visit to one of our local home improvement stores and found a wood dowel four feet long with a diameter of two inches. A friend with a table saw cut the dowel—I think it’s used as a closet clothes hanger rod—into two-inch lengths. I painted each block with two coats of Deft Clear Wood Finish. The Deft seals the wood and makes the blocks easy to clean with a damp cloth. The dowel is made of a good hard wood and the finished blocks make a durable set with a nice, smooth feel to them..
To make a scale model of Trajan’s column I needed 9 of the two-inch tall blocks. When cut, the rod made 23 blocks and that turned out to be just the right number for the kids to use to build a tower. 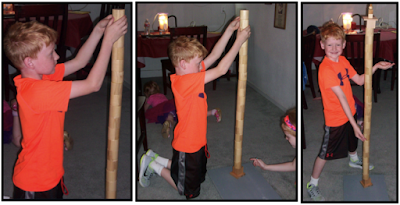 The towers that the kids built in the following pictures are examples of a column. The column is one of the six structural members used in all of the structures that civil engineers build. The column is also a compression member but more about that in the next post. Asking the question, "Who can build the tallest tower?" was all the motivation the kids needed to get them involved in the activity. We agreed that the height of every tower was simply the number of stacked blocks without the tower toppling over. Emma is three years old and wanted to be the first to build a tower. 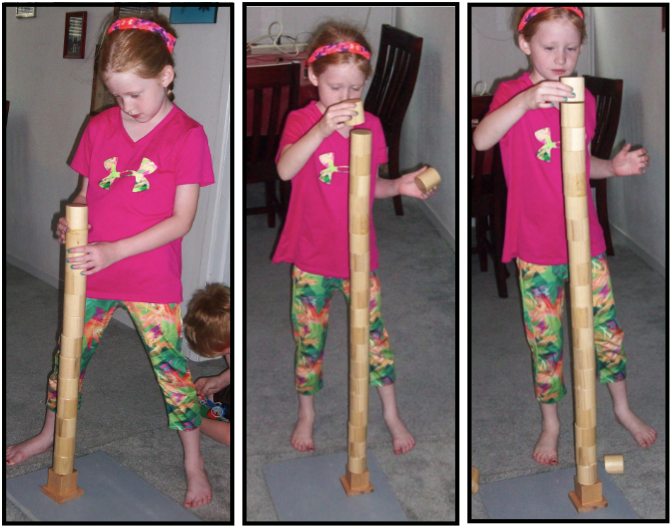 We were amazed that she was able to stack 18 of the cylindrical blocks. 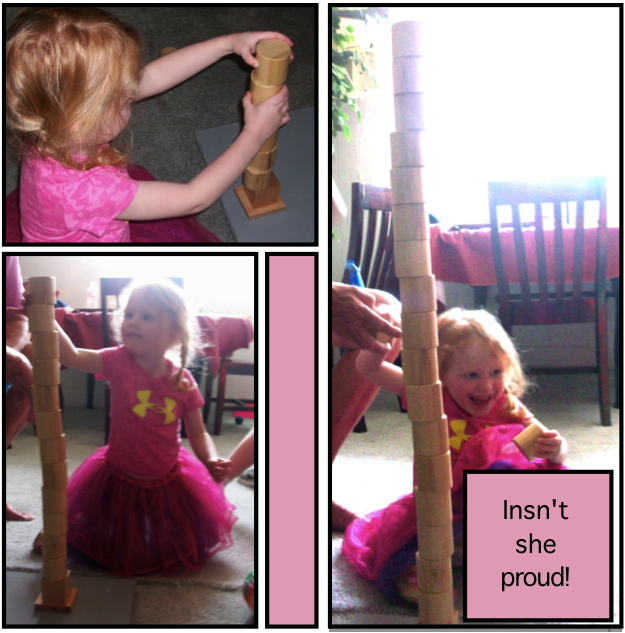 She was so proud of herself but alas, that block she has in her hand in the third picture was the block that toppled the tower. 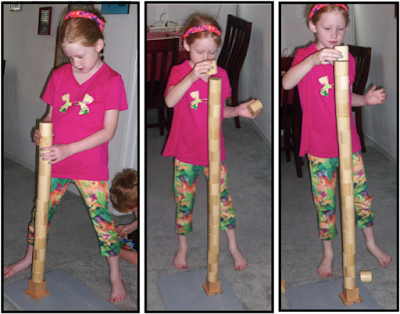 Next up was Kate, She is six and she built a tower of 22 blocks but that last block—seen on the floor—toppled the tower. Asher, the oldest of the three grand kids is eight. He used every one of the 23 blocks in his tower plus the piece I had made to model the top of Trajan's column. If you look closely at the pictures of the columns for each youngster you will notice that there is a large number of blocks that are offset in Emma's column. For her to get a column as tall as the one she built she had to make allowances higher up the column for the offsets lower down the column. She has no vocabulary to communicate to others how she built her tower but she has some form of understanding of tower building that predates language. Notice that both Kate's and Asher's columns each have very small offsets. In fact. both Kate and Asher were careful to match the base of the block being added with the top of the block at the top of the column. They too do not have the vocabulary to describe the method each used to build their tower. They have yet to develop concepts like center of gravity, center of mass, etc. but they do know, from experience, what "to balance" means and they apply that meaning when asked to build a tower of blocks. In the next post I will describe elements of the math, science, and engineering inherent in block stacking.